The magic voice isolator plugin exists !! and it’s free. 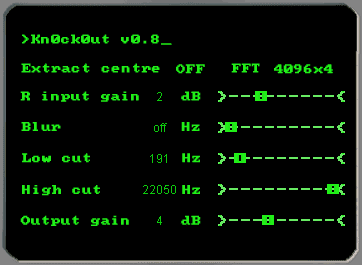 Kn0ck0ut VST plugin is a free vocal isolation plugin, based on the spectral substracting principle. It takes two inputs : voice+instru on left and instru only on right and it performs a FFT processing for removing the instrumental part. A sort of acapella maker ! Now you can download the VST plugin and copy the dll in your VST folder. if you don’t have an instrumental version, you can try to find a part in the song with no vocal, that is similar to the part with vocal. Its not working on my adobr audition cc! Wouldn’t it be enough to just do a phase inversion on one of the audio files and then do a mono mixdown ? Since the phase inverted signal will cancel the other one out , the vocal is left over . i haven’t found yet an instrumental that can phase-cancel with the normal version. it may work with a bridge. But this is not the kind of plugin to use in a sequencer like Ableton Live.